Hernán Cortés and a small group of Spanish soldiers conquered Mexico in 1521, just two years after they landed near the modern-day city of Veracruz. The swift conquest of Mexico was made possible by the armies of native Mexicans, enemies of the Aztec, that Cortés enlisted as his allies. 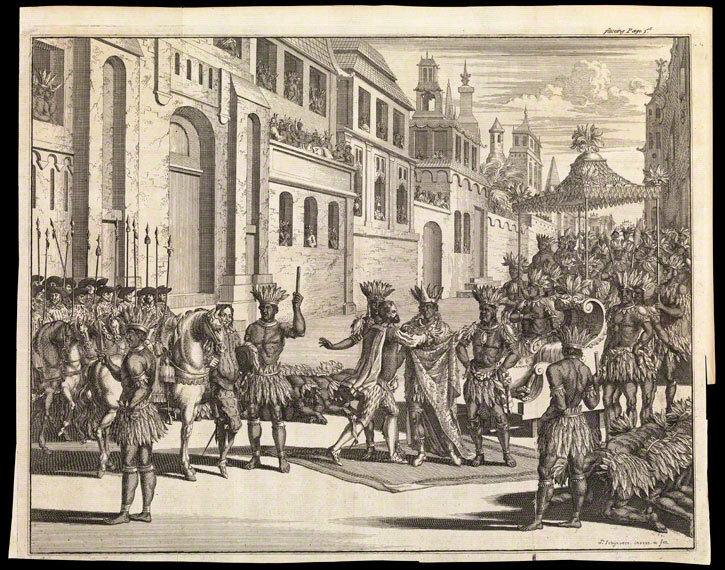 From the reports Cortés sent back to King Charles V of Spain, European audiences were astonished to learn of the existence of rich American empires such as that of the Aztec. Beginning shortly after the fall of Tenochtitlan, the Aztec capital, and continuing through three centuries of Spanish rule, the story of the conquest was illustrated with images of Cortés, Motecuhzoma II, important battles, temples, and the Mexican landscape. The resulting visual records were primarily intended for people who would never travel to Mexico. Conversely, the first Mexican images of the Spanish were created for Motecuhzoma II prior to the arrival of the Spanish in Tenochtitlan. Cortés met Motecuhzoma II on one of the causeways leading into Tenochtitlan on November 8, 1520. The event was frequently illustrated in accounts of the conquest, such as that by Antonio de Solís, an official chronicler for King Phillip IV. Since the Spanish did not make any portraits of Motecuhzoma II during his lifetime, he is depicted according to the European conception of Native Americans: dressed in a feather skirt and headdress. Conversely, Cortés's image is based on portraits made during his life. Maps, like depictions of ruins or artifacts, convey knowledge of places and things the viewer might not experience firsthand. 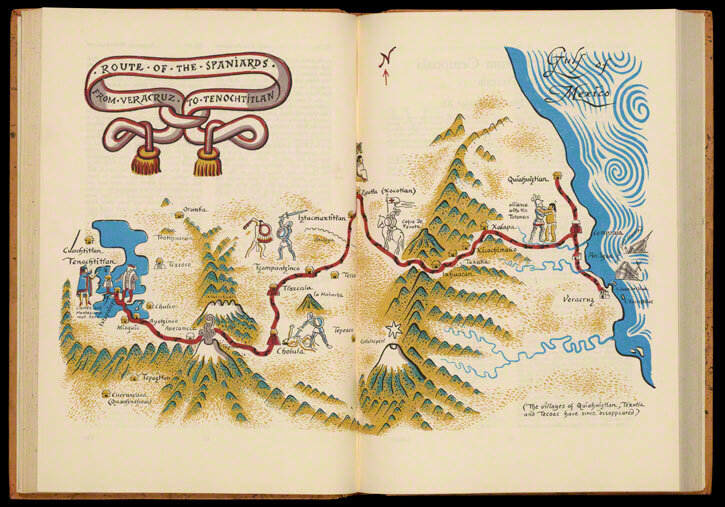 Made for American book collectors, Miguel Covarrubias's map is a mid-twentieth- century interpretation of Cortés's invasion of Mexico from the Gulf Coast to Tenochtitlan. Cortés's route is marked in red; the footprints recall those on the Codex Boturini, an Aztec manuscript that chronicles the Aztec migrations from Aztlan to the Valley of Mexico.